The new (perfect) version is Everest! 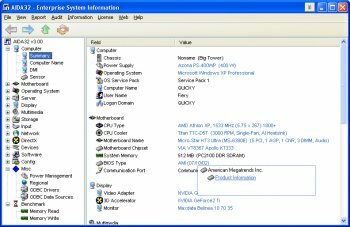 This is a good system utility to find more info about your pc system. Why would someone want to pay for a program that is really similar in features. Hot dog! Who on earth found this, now slightly old, version of AIDA? Whoever it was, however, they have my most heartfelt thanks! I still have the AIDA32 v3.93 from back in March 2004 in a ZIP file tucked away somewhere as I removed it before installing Everest Home v2.01.347. I did not install any updates to the latter after that version as I could see from the User reviews that the authors of Everest were slowly removing functions from the freeware version of the program as they will, probably, produce a version that is available ONLY as shareware. Now that FileForum has made AIDA available again, I am definitely going to remove Everest and reinstall AIDA again. I wonder if any more updates will be coming along in the future as the home sites for AIDA are now closed. Thank you BetaNews/FileForum! This one is better than the recent versions of Everest! Has more features. Outstanding program and I actually like it better than its commercial Everest imitation. Sometimes the freeware circuit does a better job of innovation. The best of what Everest free this does and it also has some other stuff you know have to pay for in that version. This is a good system utility to find more info about your pc system. Lavalys Everest is really similar to Aida32. Lavalys Consulting Group, today officially announced that it has appointed effective January 1, 2004 former AIDA32 project leader, Tamás Miklós to its executive management team. In his new role of CTO and Executive Vice President of Engineering Research and Development, Tamás will head up R&D for Lavalys including the development of its flagship award winning EVEREST, a breakthrough technology that enables the cost-effective delivery of network audit and change management. "As of March 24, 2004 we have decided to discontinue the development project that we all know as AIDA32." So version 3.9.3 is the last version :-( Thanks guys, for a great and probably THE best tool around for sysinfo! Every once in a while a piece of software comes around which make you say "damn this is good!" AIDA32 is one of those. Quiet, mannerly, and plays well with others. In short; I like this alot.